I'm deeply and greatly inspired by a number of women around me. When I get to know them I find them strong in different ways especially in facing challenges. From my family, relatives, friends, acquaintances and sometimes even strangers who I just met, I'm just so inspired by the level of strength in a woman. We all have our hidden troubles and challenges that we don't share about with the world but we still face it, keep on walking and remind ourselves to smile as well as be thankful for the simple but major fact that we are alive and are able to breathe. Time really flies. It's almost ONE year since the birth of aere. Alhamdulillah. aere's first collection was launched on 28th October 2014, last year and now we have just entered October. And today, aere fully launched its fourth collection, the Strength of Grace collection, in celebration of all of the strong women. I have been waiting for this day as I've been wanting to have my own workwear collection and have been thinking of having my own pieces designed specifically to be worn for work. I remember when I started working many many years ago, looking for working clothes was always a challenge but it was a fun kind of challenge though. :) Consisting of fashionable and wearable work-wear pieces, the aere Strength of Grace collection is the first fully focused collection of the aere work wear line, aere MIGHT. Having been in the legal and corporate world for 7 years before focusing fully on my label, I believe that other than having substance, being smart and hardworking it is also very important to be presentable and to look good to climb up that corporate ladder. This collection is about providing a stylish choice to all of the working women out there that reflect her strength and confidence because today’s ‘woman’ is everything. We have to juggle a lot of things, don't we? For me personally, this collection is not just dedicated for the professional working women in the corporate world. It is also for the entrepreneurs, the creative heads, the full-time mothers and all women juggling multiple roles in our modern society today. She’s soft and feminine, yet active and strong, she has to be. She plays multiple roles: she works hard and aims high and I feel that they all deserve some form of recognition for their choice. Today, there is a better environment and there is less of a perception of a woman's ability and competency in the workplace and that itself is a cause of celebration. But of course, it is equally important to be able to carry yourself impeccably by dressing well. When I founded aere last year, I already had in mind three different lines: aere NIGHT (evening wear), aere MIGHT (work wear) and aere LIGHT (casual wear). So the Strength of Grace collection is a part of aere MIGHT. In aere’s previous collections, Nature of Grace, Blossoming of Grace, aerexdUCk and Essence of Grace (KLFW collection) there were already pieces that we designed for aere MIGHT. 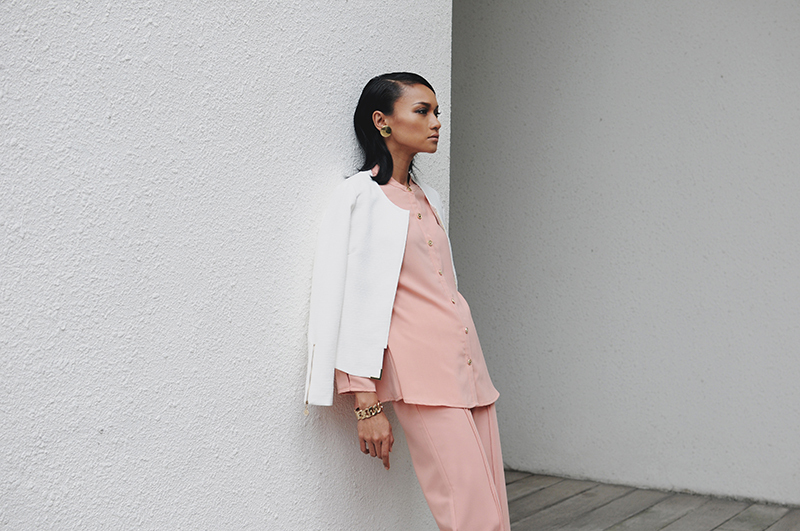 But this is the first collection that fully consists of work-wear pieces that I have always wanted to do. This collection consists of fashionable pieces designed to incorporate subtle elements of style and sophistication made of materials that are durable, versatile, easy to care for, and, most of all, comfortable right off the shelf. Focusing mostly on soft and neutral hues to accentuate a woman’s softness, there are jackets, classic longline dress shirts, blouses and pin tucked pants, amongst others, that are suitable for the office. These classic work-wear pieces have been given a modern interpretation by aere with its signature zippers and buttons and are engineered to be multi-functional. For example, the GALLIA Adjustable Zipper Skirt offers three different ways of styling: A-Line, mermaid or flared with just a pull of aere’s signature zippers and the ALUMEN Adjustable Palazzo Pants which can convert your stylish straight-cut pants into a more casual bell-bottom or flared look palazzo. Additionally, these pieces can be paired with other pieces of the aere MIGHT line. When I was naming the designs, I was inspired by names of winds (soft) and metals (strong) : BRISA, GALLIA, PLATINA, OSTRIA, ALUMEN, LEVANT. Since aere is also Latin for air, I felt it would be apt to name the pieces after elements of softness and also strength. Below are some logbook and campaign photos of the Strength of Grace collection. I'll probably share the behind the scenes story and photos soon! The limited aere pieces from the Strength of Grace collection are available online today at FashionValet and selected physical stockists soon, priced between RM149.90 – RM239.90. There's a contest on aere's IG aimed at celebrating achievements of all us women out there and to spread and inspire strength and success. Do check it out!